Just Jingle: Get in Shape! Here is the good news: I am not going to make you exercise. I AM, however, going to encourage you to take part in this week's Get in Shape Challenge on the Simon Says Stamp Wednesday Challenge blog! We want to see you create shaped cards! It can by ANY shape other than square or rectangle. The design team is playing with Lawn Fawn products this week, making our shaped cards EXTRA adorable! YAY! I chose to use one of my MFT dies to create an easel/chalkboard shaped card. It's not a rectangle, dude. It has legs. That's my story and I'm stickin' to it. For reals, though, I love this Die-Namics Blueprint shape for cards. It's just too much fun!!! I pulled out the Lawn Fawn Handsome Hamster stamps to create a fun little 'chalk' scene on my board using Simon Says Stamp white pigment ink. I layered the Lawn Fawn hello die cut over the same cut cut from white foam to give it dimension and an extra layer of white. I used the triangles from the Blueprints set to cut the banner pieces from gingham paper. Gingham CUTENESS, that is. And now it's your turn! Create a shaped card (not square or rectangle!) and link it up to the Simon Says Stamp Wednesday Challenge blog for your chance to win a $50 Gift Voucher to the Simon Says Stamp Store! A chalkboard hamster?! So cute! I love the little gingham banner, too! Very clever, Jennifer - love your idea of a chalkboard card!! Your design is amazing!! So creative!! Love how you made it look so well like a chalkboard. AMAZING! What fun card Jennifer, I love the design with the chalkcard and cute little hamster escaping from his wheel and super banner!! This is so cute! I keep thinking of getting this chalkboard die, LOVE the hamster and wheel! This is so clever, Jennifer! 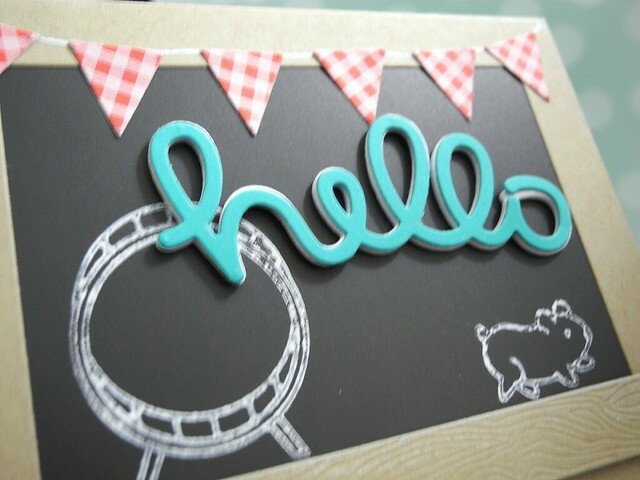 I love the idea of a chalkboard card! Adorable!! so fun, this is darlin Jingle! hope you have a fabulous weekend! Ha ha ha!!! This is adorable! Love the big hello with that cute little hamster!! Eek!! Work it! Love your chalkboard and such sweet details. Love love your chalkboard card, Jennifer! Super cute. Have a great weekend! Adorable card Jennifer!! So cute! Isn't that the cutest image from Lawn Fawn!!!! And I love the chalkboard. As always, you inspire me!